I love main street at night during Christmas its so amazingly beautiful! I didn't have a tripod so i found this elastic band and tucked it under my lens giving it some angle so its not directly on the floor. It was so cold that night lol but it was worth it! This is copyright of Andrew Serrano Photography @ 2011 and protected by My Free Copy Right.com Thank you for all the comments and support! Disneyland is so beautiful during Christmas time. I wish it could be like this all the time. Is this Disney World or Disneyland? What time did you take that? When the fire works were on? I took this around 1 am its when everyone was walking out, but there was still people roaming disney streets lol the security guards where right behind me when i was shooting this haha. haha yeah its the best at night when everyone is rushing home tired and you should see how many people come out with there tripods and start shooting! I have no idea why I didn't think of this when I was there lol Nice job! Thank you so much! I know your telling me ! lol i never been to disneyworld but the videos/pictures makes me want to go and explore so much! You've never been in Disneyworld? Lol of course i took these pictures myself but this is Disneyland not disneyworld. 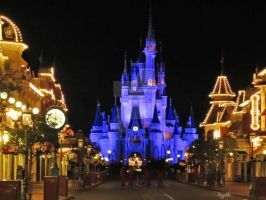 i want to go to disneyworld so bad it looks like such a good time. .____. 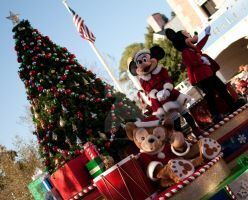 There is a difference between Disneyland and Disneyworld? Sorry, I'm so confused right now. Haha its ok, yeah Disneyland is in California and the first park Walt ever opened and Disneyworld is in Flordia the second park he opened. Oooooooh~. Okay, Now I get it, haha, thanks! Anytime! Have a good one! I love it during christmas time it was my first year enjoying it! Im glad you like it! O_O ohhh yeah! Those cookies are so good! especially with the hot coco! Ahh stop your making me hungry! lol i know! Thats the only problem with dland its not made for people who love treats lol! We hit treat bottom. This + Me = because of the beauty and awesomeness. Lol well said! Thanks for the comment! How did you get a shot like that when there were no people around!?!?!?!? !